Harden scored a team high 42 points and is now tied with hall of famer Wilt Chamberlain for the second longest 30-point plus streak in NBA history. James Harden joined some elite company by scoring at least 30 points in his 31st straight game on Wednesday but the Houston Rockets lost 121-111 to the Minnesota Timberwolves. Harden will have to wait a week to try and pass Chamberlain for the second longest streak as Wednesday’s loss was the Rockets’ final game before the all-star break. They return next Thursday to face the Los Angeles Lakers at Staples Center. It is unlikely, but not impossible, for Harden to catch Chamberlain for the longest streak in NBA history which stands at 65 straight games. Houston is 16-6 when Harden scores 40 points but the Timberwolves used a balanced attack and an inside game to beat the Rockets on Wednesday. Jeff Teague scored 27 points and Karl-Anthony Towns had 25 as seven Minnesota players scored in double figures. Harden’s 30th point on Wednesday came in the third quarter on a three-pointer from the top of the key. Harden’s streak appeared to be in jeopardy early on as he had just five points at the end of the first quarter. An explosive 15-point second quarter put Harden back on pace to keep his streak alive. Harden tried to add to his point total with a long shot from almost centre court at the buzzer, but the ball hit the front of the rim and bounced harmlessly away. 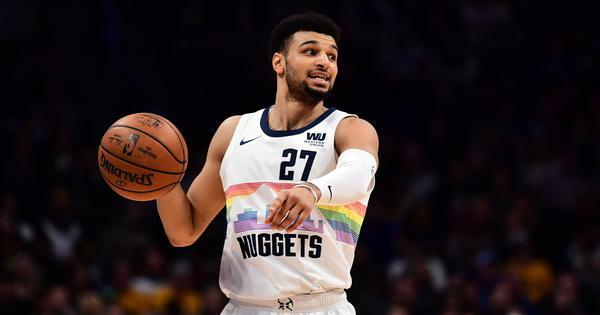 It was his 22nd three-point attempt of the night of which he made just eight baskets. 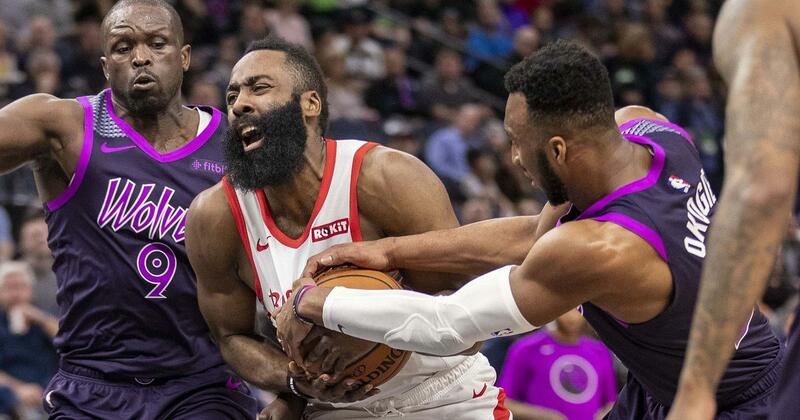 No other player on the Rockets attempted more than eight three pointers and Josh Okogie had the most three point attempts for the Timberwolves with just six. Elsewhere, UGiannis Antetokounmpo posted a triple double with 33 points 19 rebounds and 11 assists as the Milwaukee Bucks extended their longest road winning streak in 33 years with a 106-97 win over Indiana. Antetokounmpo had a hand in every basket by the Bucks in the first quarter and led them back from a 10-point deficit in the fourth. The three-time all-star from Greece carried the NBA-leading Bucks to their seventh consecutive win on the road on Wednesday. It is the longest road winning streak since the 1984-85 season. Milwaukee has also won eight of their last nine games just before the league’s all-star break. The Pacers couldn’t contain Antetokounmpo, who scored a dozen points as the Bucks went on a 30-11 scoring burst to end the game. In the first quarter he made five of their nine baskets and assisted on the other four. Bojan Bogdanovic scored 20 points and Darren Collison added 14 to lead the Pacers, whose their six-game winning streak ended with this one. Antetokounmpo made consecutive layups to tie the game 95-95 with just under four minutes to go in the fourth. He then fed Ersan Ilyasova for a layup to make it 97-95 and the Bucks ran away with it from there with superior scoring down the stretch. In other matches, Damian Lillard scored 29 points as the Portland Trail Blazers snapped Golden State’s 11-game road winning streak with a 129-107 win that featured Warriors coach Steve Kerr losing his cool and being thrown out for arguing with the officials. Jake Layman added 17 points off the bench for the Blazers, who had eight players in double figures. The win snapped a two-game skid. Kevin Durant and Stephen Curry each had 32 points for the Warriors, who watched the game turn on a flagrant foul called on Draymond Green. Portland led 110-103 before Green was called for an elbow to the face of Collins with just under four minutes left. Lillard made the three technical shots and Collins made his free throws to give Portland a 115-103 lead. The Warriors conceded defeat with two and a half minutes left by sitting their starters and bringing in the reserves. Also, D’Angelo Russell scored 14 of his 36 points in the third overtime period and the Brooklyn Nets outlasted the Cleveland Cavaliers 148-139. Joe Harris scored 25 points and Carroll had 18 as the Nets improved to above .500 (30-29). Jordan Clarkson scored a career-high 42 points and Collin Sexton had 24 points and Marquese Chriss added 23 in the loss. The teams were playing their final game before the all-star break. In Toronto, Pascal Siakam scored a career-high 44 points and Jeremy Lin finished with eight in his Toronto debut as the Raptors beat the Washington Wizards 129-120.